Training your dog to use good manners helps ensure you'll have a well-behaved pet for many years to come. Wendy Nan Rees offers tips and training advice you can use to teach your dog to be polite in different situations. Have you ever gone to a friend's home only to have her dog jump on you and hear her say "Oh so sorry" and "Look how cute my baby is" in almost the same breath? I have, and to be honest I do not like it when my boys get too excited and forget to use their manners. To help them remember their good manners, I have to go back to basics and have a touch up lesson. Here are a few tips about canine manners. First, there are basic manners. I hope every dog owner takes their new dog to basic puppy classes. This is a good idea no matter how many dogs you have had. Learning good manners from either a basic class or working alone with your dog will create a good foundation of training that will benefit your dog's life from then on. Please know before you can teach Rover any tricks, you should take the time to bond and learn the most basic manners, including sit, come, stay and down. Now, some dogs are fast learners and some are not. How well they learn is really about how much time you want to put into training them. I personally suggest you should work in 15-minute intervals two to three times a day until your dog really has learned the basics. You will have a great foundation, and, by the way, you also are teaching your dog who the boss is and bonding with him. Think of this as a bonus for your efforts. It is important to find a trainer you like and who has been recommended to you by your vet and/or your friends. Also, if you know someone who has well-behaved dogs, I bet you can ask them too. These are all good places to start. 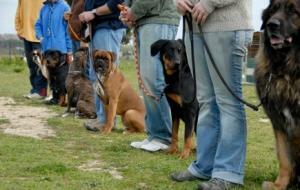 Remember, puppy class is not only for learning the basics, it is a great safe place to socialize your dog. Many people say "I want private training." This can be great, but I sometimes think Rover misses out on some controlled socialization time. Remember, dogs not only need to get along with people, but with other animals as well. Once you have learned the basics, you may want to move up to agility or working dog activities. Or, maybe you are happy with just having a well-mannered dog that has a solid sit, stay, come and down. Once these commands are mastered, the world is your oyster for you and your dog. You have to be consistent when you are training your dog, but being consistent is not always easy. Sometimes, when my day is very busy I think, "Oh, I will do this tomorrow." I stop and tell myself, "No, take five minutes now to work with my dogs." Not being consistent is unfair to everyone involved at the end of the day. Always reward your dog with a favorite treat saved just for when training. He will look forward to this all the time. Please be sure to reward your dog at the right time. When he's in the correct position and you say "Good boy, Rover," give him the treat immediately. Please have your treat out and ready; it may be at a very critical point when you first get the down, and you would not want to miss that "good boy." Training comes first before play time or before mealtime. Be a fun person around your dog; he will want to work hard to please you. Remember, you are your dog's pack leader, and he wants nothing more than to make you happy. Keep in mind that learning takes time and consistency. Anything worth having takes time, and training a dog is no different. I like to use a high-pitched voice with my dogs, they really respond to it. However, some dogs are easily excited, so you may want to try giving commands in a calm tone and reserve excited tones strictly for praise. Never say the word "No" and your dog's name at the same time. You should use his name for the positive. When reprimanding, use a deep voice with a firm "No," but don't use his given name. This is a common mistake, and once you have learned this tip, you will see how quickly your dog learns "no" and "Good boy/girl." Remember, this is teamwork in progress; you need to help your dog to be successful, and you must be consistent. Motivation is very important for you both. Your dog wants to be rewarded with love and that very special treat. You want to have a well-trained dog, so it becomes a wonderful motivation for you both. How Do You Know When Your Dog Is About to Give Birth?